A couple of days ago, I emailed my minister, Rev. Dale Jukes, and told him about my commitment to NoBloPoMo and Blog Blast for Peace. I told him that I am going to post Peace related writings to this blog, and to Reba's Run, every day of November and possibly beyond this month if I have enough material to continue along. I also wrote a short letter in this regaurd and I sent it to every Spiritual Centre listed in the back of the Creative Thought Magazine (all 144 of them that had email addresses listed). So far, I've heard nothing back from the 144 letters I sent out, except a few that have come back undeliverable. However, Rev. Dale jumped right in to give me support in this. He not only has promised to write something for me to post, but he also posted about my "mission", on some site for ministers, and has gotten some emails saying what a wonderful idea this is, and promising me support. so now I just have to be patient and give some people a bit of time to write something for me to post here this month. If we are going to have World Peace it is something we must create together. As long as we impose what we think is right, even if we truly believe that it is right for other people, we will not find peace. Peace can only come from within the individual. Peace cannot be imposed on people. No matter how enlightened some concept or philosophy may seem if it is not embraced by most individuals it will not create peace. It is the nature of humans to resist the things they do not understand or accept. If a concept is not accepted by society then that concept will not survive peacefully because we humans will continue to resist what we do not accept of our own free will. Thus the great revolutions we see in our history. However true this is, it remains the nature of mankind to seek peace. To humans, love feels good, and fear and anger feel bad. We grew up in a world where the strong have dominated the weak. In our early society, before we had laws, strength; either individually, or that of the community or nation was the way we survived. Tribes banded together for their survival. Other tribes who were more aggressive banded together to provide for themselves by taking from the weaker and less aggressive tribes. We now understand enough to achieve more positive social solutions. Monday: Think about the times you try to get other people to do things the way you think they should be done. Tuesday: Think about the times other people try to get you to do things the way they think they should be done. Wednesday: Think about what it would be like if other people accepted doing things the way you wanted them to. Thursday: Think about what it could be like if you could just accept other people's ways of doing things. Friday: Think about what it would be like if you were each free to choose your own way of doing things. Saturday: Think what it would be like to negotiate differences with the object of freedom for each to do it their own way. Sunday: Resolve to fully respect the differences of others in all relationships in your life. 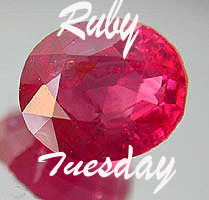 Welcome to this week's Ruby Tuesday, hosted my Mary the Teach at Work Of The Poet. My post are some photos of someone else's garden, taken by me this summer. Lets call this "Peaceful Summer Reminiscing" or "Peaceful Rememberings"
Peace and Joy to all that come here to read my blog. Written/Photographed/Posted by Alice (in BC Canada) at or about 11/03/2008 08:42:00 p.m.
Beautiful reds! :) I love roses! Mine Ruby post in HERE. Hope you have time to visit. Thanks. Beautiful flowers, it's so nice to see them now with this sad and cold weather !